This month's employee spotlight goes to an individual who spends half his time in our North Salt Lake office and the other half of his work day at one of our extremely valuable clients who is also in the area. Although his offices aren't far apart, he has been such a valuable asset to both us and our client and he's done such a great job managing his time between the two. David is such a fun guy to have as an employee of YES and we wouldn't be near as strong of a team without him! We are very grateful for the time we get to spend with him in person, but are also extremely grateful for the support he offers our client. They have expressed their gratitude to us as well. Kudos to David Carrejo! You rock! I enjoy the flexibility and atmosphere its always positive. Motivated and positive people. Continued success of working with positive people. It would be a great honor to meet Jackie Robinson. So far its been Jamaica. 7. Choose one: Cowboys in the Super Bowl or Cardinals in the World Series. Why? Depends what season it is… if it's October we are going Red for the Cardinals, if it is February we are going Blue for the Cowboys!!!! Safety. Making sure the employee understands and walks away knowing some key points. Doing walkthroughs and keeping in contact with employees. Be ready to work the next day. Don't lose the opportunity. 11. Who would do better? Reed Laws, the president of YES, with the VP of YES Kerry Westenskow’s height? Or Kerry with Reed’s height? I would say Reed, he can always wear Pee Wee Herman Elevator shoes if he's not comfortable with the weather up there he can always take them off. 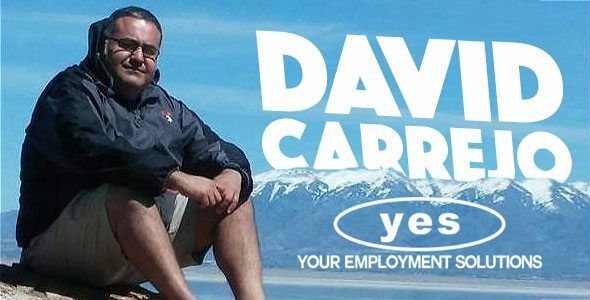 Thanks David for all that you do to make YES the best staffing company in Utah!